Doppler ultrasonography is a medical non-invasive study of the heart and blood vessels, using ultrasound with high-frequency waves. It is based on the physics-known Doppler Effect for imaging the blood circulation in them. C. Doppler describes this effect as dependence between the wave frequency of the transmitted sound from a moving object and its ride off from the observer. In the case of Doppler ultrasound devices, the moving objects are erythrocytes in the blood vessels. Doppler ultrasonography provides a color picture detecting the blood flow. Doppler ultrasonography provides information about the presence of blood flow in the studied vessels, as well as its direction, speed, turbulence, and other characteristics. It is used in vascular surgery to diagnose and assess the severity of various blood vessel diseases – arterial thrombosis and embolism, aneurysms, varicose veins, venous thrombosis, thrombophlebitis, etc. The method is used also for assessing the effect of vascular treatment. An ultrasonography using the Doppler Effect is also used for the screening and prevention of atherosclerosis in at-risk patients. The visualization of the blood flow of the head, abdomen, and extremities allows detection of critical constrictions and obstructions. Their timely detection makes possible the prevention of the development of complications – gangrene, stroke, and heart attack. Doppler ultrasonography allows the determination of the cardiac output, structure, thickness, and functioning of the heart valves. It is recommended for patients with heart valve disease, heart failure, congenital heart disease, blood clots, etc. Doppler ultrasonography is also used to diagnose fluid in the pericardium. This method of testing is completely harmless and can be repeated as often as necessary. It allows real-time observations of the blood flow without any radiation and completely non-invasively. Traditional ultrasound – creates pictures using sound waves which are reflected by the tissues. Ultrasound passes through human tissues and fluids but is bounced back off certain structures. Based at these echoes, the ultrasound machine can visualize structures, situated deep inside the body, without any invasiveness. The ultrasound examination gives a two-dimensional greyscale ultrasound image of the tissues. The modern ultrasound machines are able to show two-different images simultaneously. They can visualize the grayscale ultrasound picture of the body tissues together with a color visualization of the blood flow, based at the Doppler Effect. The color is layered over the greyscale ultrasound image, allowing the ultrasound operator to obtain information for the blood flow in arteries and veins and at the same time observe the surrounding tissues. The Duplex ultrasound machines allow the operator to select a particular area on the ultrasound image, and detect the blood flow (i.e. listen to the Doppler waveform) only there. 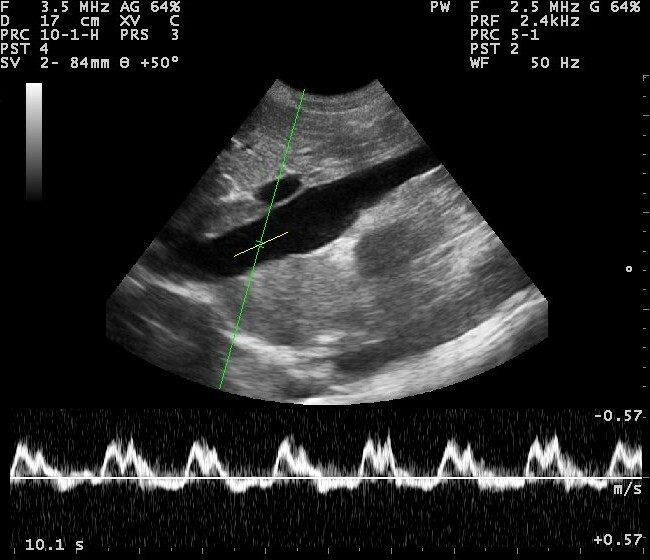 The Duplex ultrasonography shows the blood flow in the investigated tissue. It helps to detect blockages in the vessels, detect vessel’s width, etc. A duplex ultrasound is used in diagnose of an abdominal aneurysm, blood clots, arterial occlusion, venous insufficiency, varicose veins, renal vascular disease, carotid occlusive disease. Like the Doppler ultrasound, this method of testing is completely harmless and can be repeated, as often, as necessary. It allows real-time observations of the blood flow and the tissues without any radiation and completely non-invasively. Doppler: Doppler ultrasonography is a medical non-invasive study of the heart and blood vessels, using ultrasound with high-frequency waves. Duplex: Duplex ultrasonography is a medical non-invasive study, which combines traditional ultrasonography and Doppler ultrasonography. Doppler: Doppler ultrasonography provides a color picture detecting the blood flow. Duplex: Duplex ultrasonography provides a color picture detecting the blood flow and a two-dimensional greyscale ultrasound image of the tissues. Doppler: Doppler ultrasonography provides information about the presence of blood flow in the studied vessels, as well as its direction, speed, turbulence, etc. 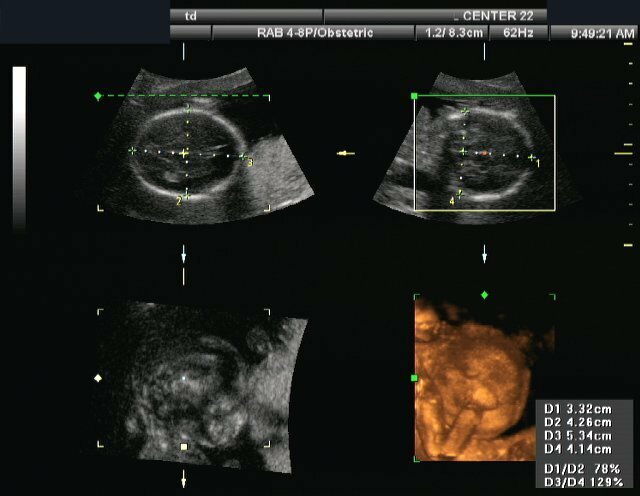 Duplex: Duplex ultrasonography provides information about the presence of blood flow in the studied vessels, as well as its direction, speed, turbulence, etc. together with an image of the surrounding tissues. Doppler ultrasonography is a medical non-invasive study of the heart and blood vessels, using ultrasound with high-frequency waves. Duplex ultrasonography is a medical non-invasive study, which combines traditional ultrasonography and Doppler ultrasonography. Doppler ultrasonography provides a color picture detecting the blood flow. Duplex ultrasonography provides a color picture detecting the blood flow and a two-dimensional greyscale ultrasound image of the tissues. Doppler ultrasonography provides information about the presence of blood flow in the studied vessels, as well as its direction, speed, turbulence, etc. Duplex ultrasonography provides information about the presence of blood flow in the studied vessels, as well as its direction, speed, turbulence, etc. together with an image of the surrounding tissues. Dr. Mariam Bozhilova Forest Research Institute, BAS. "Difference Between Doppler and Duplex." DifferenceBetween.net. 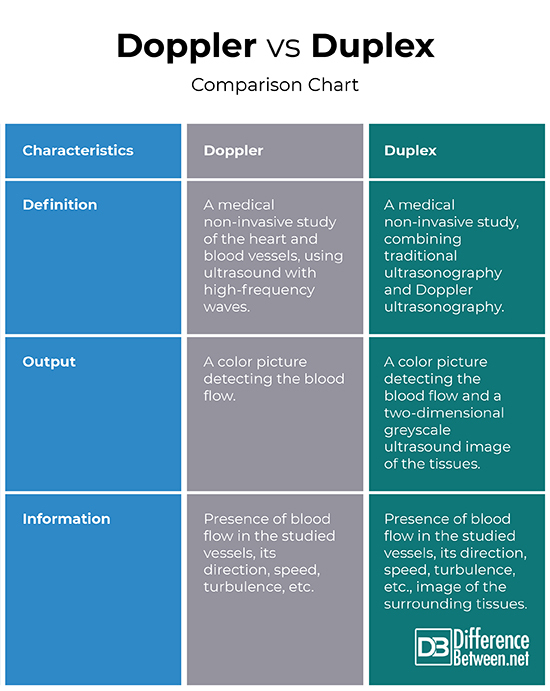 November 22, 2018 < http://www.differencebetween.net/science/health/difference-between-doppler-and-duplex/ >. Clement, D., J. Shepherd. Vascular diseases in the limbs. Maryland Heights: Mosby – Year Book, Inc. 1993. Print. Hennerici, M., D. Neurburg-Heusler. Vascular Diagnosis with Ultrasound. Stuttgart-New York: Thieme Verlag. 1998. Print. Kuchling, H. Physics. Moscow: Mir. 1982. Print.